A world without seasons is as unnatural as a person without moods. It's hard to believe that it's been four months since I last wrote. I certainly didn't think when I posted on May 22nd that the entire summer would go by without a word being written on Grief & Gratitude. I'm not exactly sure what happened, but in the midst of it all, I discovered that I am a "foul-weather" writer, not a "fair-weather" one. Here in the Pacific Northwest, we are coming off one of the best summers ever. We’ve had long dry days and higher than usual temperatures making for endless excuses to not sit inside in front of a computer (especially when I work in front of one for many hours a day). Never in the 35 years that I've lived here have I spent so much time outside. We've walked our new dog Jack in the late afternoons, hiked in the Olympics on the weekends, played bocce with friends on our new bocce ball court, worked in the garden and eaten many, many dinners "al fresco." In short, life happened. So as we ease into a new season, I imagine that as the weather changes there will be less opportunity to be outside, and I should find more time to write. 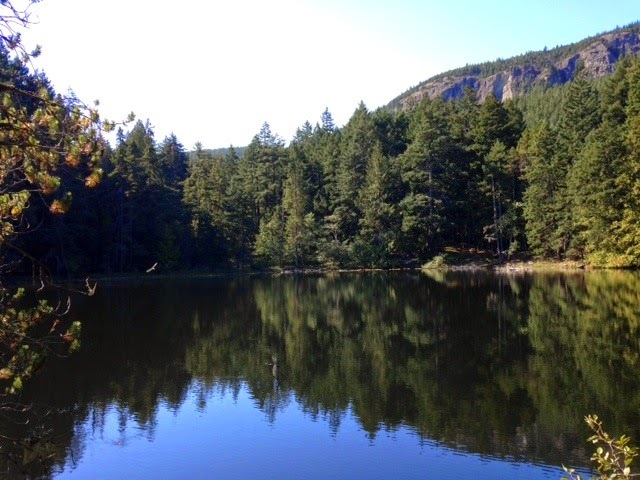 To close out the summer of 2014, my husband Israel and I spent five days up on Orcas Island. I imagine everyone has a special place to escape yearly. For me, it’s Orcas. It has such serene beauty and stillness that I always feel a shift inside me when I’m there. A centering takes place and I come away from my time up there feeling more balanced. It certainly didn't start out that way. The first time I went to Orcas Island was in the early 1970's when my dad hijacked our usual plans of spending the month of August in La Jolla (we lived in Arizona and August is unbearably hot) and instead brought us up to Orcas where it rained for two solid weeks. Needless to say, we (the kids) hated it and the next year we were back in La Jolla. But the wheels had begun to turn in my dad's mind and within a couple of years he and my mom bought property on Orcas and built a cabin. So in 1979 I began coming in earnest to Orcas Island, and along the way fell in love with it. This year our daughter could only join us for one night, and our son couldn’t come at all. So for the most part it was just the two of us, and we spent a lot of time reminiscing about past trips to Orcas. On our last full day (which happened to be the last day of summer), we hiked up to Twin Lakes in Moran State Park. Whenever I walk amongst those old growth trees, I feel like a part of my past is there. I think that the natural world provides such comfort to me because it feels big enough to handle the good and the bad, the happiness as well as the grief. It’s such a natural container for all that one experiences in life. Anyway, as we hiked along the very familiar path we reminisced about all the different times over the years that we have explored the many trails of the park. Snapshots of memories flashed in my head as I remembered hiking in my mid twenties with my soon-to-be husband when I first introduced him to the Northwest, hoping that he would love it as much as I did (he did). Just a couple of years later I remembered walking the same path with our beloved first dog Wilbur, as well as various friends of ours from those early years in our marriage. Then just a few years after that came Matthew, then Jordan and finally Aviva. How I wish that somehow we could replay those times and watch them in real time. I would love to sit back and watch my 23-year-old self hike with my then 23-year-old boyfriend and then fast forward six years to see us walking with a baby Matthew strapped to our backs. We’d be able to see my parents (then in their 40’s and 50’s) hiking alongside us en route to a picnic by the lake. Wouldn't it be wonderful to watch our young family of five canoeing in our Old Town canoe out to the little island in the middle of Mountain Lake? Yes, we have pictures, but wouldn't it be great to watch it all transpire again? I guess I’m feeling a little nostalgic as that part of our lives-the raising of kids- is over, and all we are left with is a lovely trail of memories to savor. When we returned home last week, it was obvious that fall was upon us. The shift in light, the shorter days, the rain and gray skies were finally here. And I must admit, I welcomed it. Fall is my favorite season. As much as I love summer in the Northwest and the beauty of being outside, I am always grateful for the shift of seasons. For me, it’s a time to reflect and turn inward. I love nothing better than curling up with a book and a cup of tea on a rainy Sunday and not feeling guilty that I’m not outside. Fall has always felt like the start of the New Year to me, probably because that’s when a new school year begins. It’s also when Rosh HaShana (the Jewish New Year) occurs. Right now we are in the period known as the Days of Awe-the ten days between Rosh HaShana and Yom Kippur It’s a time when we undertake the daunting tasks of introspection and reflection and begin to make the necessary changes. It’s about looking inward and deciding who it is you want to be and understanding that it’s never too late for real change and real growth. Of course, this is a very simplistic explanation of what happens between these two most holy Jewish days. Life is so busy and over-scheduled that it's far too easy to glide through it without taking time to reflect and to soul search. But, to me, the shorter days and cooler temperatures of fall lend themselves to self-examination. After a summer of fun activities I crave some quieter times of reflection. So my wish is that we all take some time in the coming days and weeks to reflect so that we can, in turn, create a new year full of rich possibility.